Since Chase did away with the Chase Marriott Premier card in favor of what is now the Marriott Bonvoy Boundless card, they have been targeting people to upgrade by offering bonus Bonvoy points. In most ways, the new Boundless card is actually better. It earns more points per dollar across the board and, for just a $10 addition to the annual fee, gives you one free night good for a Bonvoy property of up to 35,000 points a night. The old Premier card gives you only up to a 25,000 point / night room. There’s one HUGE difference in these credit cards, though. 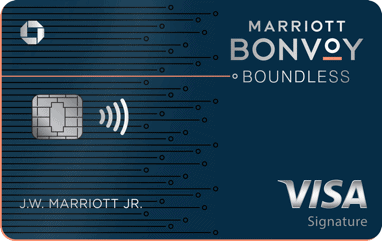 stackable with any other Marriott Bonvoy earning cards, such as the business version of the Chase Marriott card or any of the Amex versions. Once you get 15 elite nights from any of those cards, you won’t get them from any other cards for that year. Even if you have all currently attainable cards, you still just get 15 nights. The old Marriott Premier card, though, allows you to earn 1 elite night credit for each $3,000 in spend. While not killer for any general spending, for some this method of earning bonus elite nights is pure gold, since Marriott has made it quite difficult to earn more than 25 bonus elite nights a year outside of their own stay promotions (15 for a credit card and another 10 if you hold a Rewarding Event). Let me know what you get and if it sways you to upgrade. According to the Chase rep I spoke to, these would be in addition to any elite nights you get from another credit card. So if you have an Amex giving you 15 nights and get targeted for 10 to upgrade, you’d get all 25 this year. Can you Downgrade to the Marriott Premier from the Boundless to get the chance to earn the elite nights for spending? able to downgrade to the Premier. If you happen to have the Boundless and it’s been a year, and you’re on the phone with Chase, see if you can downgrade and let us know! The downside of downgrading, though, aside from the decreased earnings for spend is that your annual free night drops from being worth 35,000 to only 25,000 points – and while a ton of great Marriott’s are Cat 5, good luck on the Cat 4. The representative did also confirm that you can upgrade to the Ritz Carlton card if you would get more value from that card than from your Boundless card. How would you play this? Would y0u upgrade for the elite nights? Downgrade for the opportunity to earn elite nights for spend? Let me know here, on Twitter, or in the private MilesTalk Facebook group.